NOTE: The ProLiant BL660c Gen8 requires the c3000 Enclosure to be configured with 6 fans. NOTE: The ProLiant BL660c Gen8 requires the c7000 Enclosure to be configured with 10 fans. NOTE: LRDIMMs and RDIMMs are distinct memory technologies and cannot be mixed within a server. NOTE: Depending on the memory configuration and processor model, the memory speed may run at 1600MHz, 1333MHz, or 1066MHz. Please see Memory Population Table later in this document or the Online Memory Configuration Tool at: www.hp.com/go/ddr3memory-configurator. NOTE: FlexibleLOM options include 10Gb FlexFabric, 10Gb Flex-10, and 10Gb Ethernet. NOTE: The server supports one or two FlexibleLOMs. NOTE: For Pre-configured Model configurations, two FlexibleLOMs are already included; no additional FLexibeLOMs are added. NOTE: For a Factory Integrated Model configuration with one FlexibleLOM, it is added in the HP Networking section of "Step 2" in the Factory Integrated Models section. NOTE: For a Factory Integrated Model configuration with two FlexibleLOMs, the second FlexibleLOM is a different part number. You must select the first FlexibleLOM in the "Step 2" HP Networking section and select the second FlexibleLOM in the "Step 4" HP Networking section. 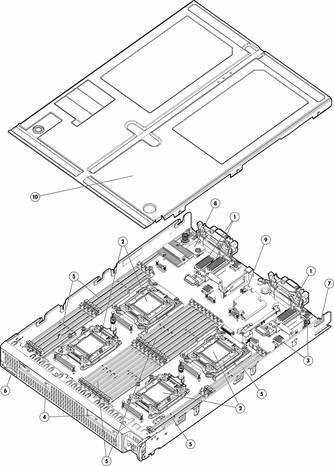 NOTE: All FlexibleLOMs are dual port: one port is routed to interconnect module bay 1 and the other to bay 2.
x16 PCIe 3.0 Type B (supports Type A and Type B mezzanine cards (expansion slot 3). Dual-port to quad-port (depending on the model) 10Gb FlexFabric, 10Gb Flex-10, 10Gb Ethernet, and 1Gb Ethernet for additional Ethernet network ports. Dual-port 8Gb and 16GB Fibre Channel HBAs for SAN connectivity. QDR and FDR InfiniBand for low latency and high bandwidth server interconnectivity. HP ROM (read only memory) is now digitally signed using HP's Corporate Signing Service. This signature is verified before the flash process starts, reducing accidental programming and preventing malicious efforts to corrupt system ROM. NOTE: For further information, please refer to HP's RBSU (ROM based setup utility) user guide at www.hp.com/support/rbsu. NOTE: The HP Smart Array P220i supports RAID 0 and 1. It includes 512MB flash-backed write cache (FBWC) on pre-configured models and is optional on factory integrated models. The FBWC is not required for RAID capability. The purpose of the cache is it can increase hard drive write performance and provides data protection in case the server losses power. NOTE: The HP Smart Array P220i supports upgradeable firmware with recovery ROM. NOTE: The ProLiant BL660c Gen8 server includes the new HP hot plug small form factor (SFF) SmartDrive carrier for enhanced management and reduced maintenance errors. HP drives from previous generation servers are not compatible with the ProLiant BL660c Gen8 drive bays. NOTE: The mixing of standard SAS drives with SAS SSD drives is supported within the server, but limits the RAID configuration to two separate RAID 0 volumes. Mixing of other drives types is not supported. NOTE: For more information on HP's Certified and Supported ProLiant Servers for OS and Virtualization Software and latest listing of software drivers available for your server, please visit our Support Matrix at: http://www.hp.com/go/ossupport and our driver download page http://www.hp.com/support/BL660cGen8. The HP BladeSystem c7000 rack enclosure is 10U high and holds up to eight (8) ProLiant BL660c Gen8 servers plugged vertically. The HP BladeSystem c3000 rack enclosure is 6U high and holds up to four (4) HP ProLiant BL660c Gen8 servers plugged horizontally. NOTE: For additional enclosure information, please see http://h18004.www1.hp.com/products/blades/components/enclosures/c-class/index.html. HP ProLiant BL660c Gen8 is a single-wide, full-height server blade that plugs into the HP BladeSystem c3000 and c7000 enclosures. HP Active Health System: Always on, continuous monitoring for increased stability and shorter downtimes; 100% configuration history; Health and service alerts and easy export and upload to Service and Support. HP Intelligent Provisioning: Lets customers provision and configure a single server without any separate media. No more SmartStart CDs or firmware DVDs are needed. HP Service Pack for ProLiant (SPP) and HP Smart Update Manager (HP SUM) provide a comprehensive approach to firmware and system software maintenance. Together they provide better operating stability and ensure maximum uptime. The SPP will be updated at a predictable cadence, typically coinciding with new HP server hardware launches. By enabling firmware to be updated online and integrating firmware and system software updates in one operation, HP SUM and the SPP offer faster updates of individual servers and dramatically faster updates of entire BladeSystem enclosures. Further improving system uptime and stability is the fact that HP provides 12 months of support for each Service Pack for ProLiant release. Data Bus ECC protection provides automatic correction from a single data bit error and detection of double data error bits. Often called single error correction/double error detection (SEC/DED). Memory online spare mode (also known as rank spare mode) detects a rank that is degrading and switches operation to the spare rank. HP offers the rank sparing rather than DIMM sparing as rank sparing uses less spare memory resulting in reduced overhead. Memory demand and patrol scrubbing prevent accumulation of correctable errors and reducing the likelihood of unplanned downtime. Address parity protection available on RDIMMs and LRDIMMs detects address bit errors to improve service time and overall system availability. Memory thermal control is used to prevent DIMMs from overheating. Achieved by slowing down the memory access rate per the temperature monitored by DIMM sensor. One or two FlexibleLOM connectors each supporting two (i.e. redundant) Ethernet ports routed to redundant interconnect modules. Two (2) hot-plug SAS/SATA/SSD drive bays. Integrated HP Smart Array P220i Controller with 512MB FBWC capability, RAID 0 and 1, and upgradeable firmware with recovery ROM capability. NOTE: The 512MB flash-backed write cache (FBWC) is included on pre-configured models and is optional on factory integrated models. The FBWC is not required for RAID capability. The purpose of the cache is it can increase hard drive write performance and provides data protection in case the server losses power . Up to eight optional HP D2200sb and/or D22020sb Storage Blades for attachment of up to 12 drives per Storage Blade (up to 96 drives total) within the c-Class enclosure. Optional dual-port Fibre Channel mezzanine card(s) for redundant SAN connections. Pooled power for true N+N power redundancy through up to six (6) hot-plug, high-efficiency, common slot enclosure-based power supplies (configuration dependent). HP Dynamic Power Capping safely limits power usage without impacting performance by capping peak usage instead of average power usage, removes risk to electrical infrastructure with a fast-acting, hardware-based capping algorithm, and reclaims more power by dynamically controlling power limits based on workload demand. Up to eight interconnect modules per server blade enclosure providing four simultaneous redundant fabrics for FlexFabric, Virtual Connect Ethernet, Fibre Channel, InfiniBand, Pass Thru Ethernet, etc. Enclosure crosslinks between adjacent enclosures to provide interconnect module-to-module connections or as Virtual Connect module stacking links. NOTE: Server warranty includes 3 year Parts, 3 year Labor, 3-year on-site support. Warranty repairs may be accomplished through the use of Customer Self Repair (CSR) parts. These parts fall into two categories: 1) Mandatory CSR parts are designed for easy replacement. A travel and labor charge will result when customers decline to replace a Mandatory CSR part; 2) Optional CSR parts are also designed for easy replacement but may involve added complexity. Customers may choose to have HP replace Optional CSR parts at no charge. Additional information regarding worldwide limited warranty and technical support is available at http://h18004.www1.hp.com/products/servers/platforms/warranty/index.html. Up to three (3) optional Fibre Channel mezzanine HBAs are supported on the HP ProLiant BL660c Gen8. HP ProLiant BL660c Gen8 server blades are optimized for HP MSA, EVA and XP. HP Insight management software HP Insight Control HP Insight Control, a product option, delivers essential infrastructure management that can help save time and money by making it easy to deploy, migrate, monitor, remote control, and optimize your IT infrastructure through a single, simple management console. For more information, see http://www.hp.com/go/insightcontrol. HP Insight Control includes one year of 24 x 7 HP Software Technical Support and Update Service ensuring rapid access to HP support staff and proactive delivery of software updates. For more information about this service, see http://www.hp.com/services/insight. Whether you need to solve a specific data protection, archiving, or storage command and control challenge, or deliver on strategic consolidation, compliance, or continuity initiatives, look no further than HP storage software. Our storage software helps you reduce costs, simplify storage infrastructure, protect vital assets and respond faster to business opportunities. Whether you're a large enterprise or a smaller business, HP data protection and recovery software will cost-effectively protect you against disaster and ensure business continuity. HP's storage software enables you to comply with data retention and retrieval requirements, improve application performance, and reduce costs by efficiently migrating infrequently accessed or less valuable data to lower cost storage. HP's storage resource management software reduces operational costs and provides the command and control foundation you need to efficiently manage and visualize your physical and virtual environments. HP offers array-based and host-based replication software for use in disaster recovery, testing, application development and reporting. Maximize your investment in HP storage and networking with software that enables hardware-specific configuration, performance tuning and connectivity management. With HP StoreVirtual VSA you can use the power of virtualization to turn a set of heterogeneous and disconnected physical disk drives in your servers and storage devices into a single pool of logical storage capacity. NOTE: For more information available Storage Software including QuickSpecs, please see: www.hp.com/go/storage/software. HP Insight Online HP Insight Online is a new addition to the HP Support Center for one stop, secure access to product and HP support information personalized to your IT environment. Insight Online can automatically display devices remotely monitored by HP Insight Remote Support. With Insight Online's easy navigation you can efficiently track your IT support contracts and device status from anywhere and at anytime. http://www.hp.com/go/insightonline. NOTE: Not all Pre-configured Models are available in all regions. Check with your local country HP offices for availability. NOTE: Total of 32 DIMM slots. Expansion Slots 3 standard - Slot 1 supports Type A mezzanine Cards. Slots 2 and 3 support Type A and Type B mezzanine cards. Warranty Server warranty includes 3 year parts, 3 year labor, 3-year on-site support. NOTE: This section lists some of the steps required to configure a Factory Integrated Model or configure-to-order (CTO) server. To ensure only valid configurations are ordered, HP recommends the use of an HP approved configurator. Contact your local sales representative for information on CTO product offerings and requirements. NOTE: All CTO (Configure to Order) systems will be populated with sufficient hard drive blanks based on the number of initial hard drives ordered with the server. HP Processors NOTE: The BL660c Gen8 supports two or four processors; one and three processor configurations are not supported. NOTE: All processor kits contain two (2) processors. NOTE: If four processors are desired, select one 2P xxxxxx-L21 processor kit here in Step 2 and one xxxxxx-B21 2P processor kit in Step 3. NOTE: HP memory from previous generation servers are not qualified or warranted with this HP ProLiant Server. NOTE: LRDIMMs and RDIMMs are all distinct memory technologies and cannot be mixed within a server. NOTE: A minimum of one DIMM is required per processor. NOTE: Depending on the memory configuration and processor model, 1600MHz and 1333MHz memory may operate at a lower speed. Please see the see the "Memory" section later in this document and the Online Memory Configuration Tool for details at www.hp.com/go/ddr3memory-configurator. NOTE: When HP 24GB (1x24GB) Three Rank x4 PC3L-10600R (DDR3-1333) Registered CAS-9 Low Voltage FIO Memory Kits are used, all 32 DIMM slots on the BL660c Gen8 must be fully populated with these 24GB DIMMs. NOTE: The ProLiant BL660c Gen8 supports one or two FlexibleLOMs. NOTE: For a single FlexibleLOM Factory Integrated Model configuration, select the option here in the "Step 2" HP Networking section. NOTE: For a two FlexibleLOM Factory Integrated Model configuration, the second FlexibleLOM is a different part number. When two FlexibleLOMs are needed you must select the first FlexibleLOM here in the "Step 2" HP Networking section and the second FlexibleLOM from "Step 4" HP Networking section. NOTE: For a two FlexibleLOM configuration, the HP Flex-10 10Gb 2-port 530FLB FIO Adapter may be configured with the HP Flex-10 10Gb 2-port 530FLB Adapter (656590-B21) or the HP 10Gb 2-port 560FLB Adapter (655639-B21). NOTE: For a two FlexibleLOM configuration, the HP FlexFabric 10Gb 2-port 554FLB FIO Adapter may be configured with the HP FlexFabric 10Gb 2-port 554FLB Adapter (647586-B21) or the HP 10Gb 2-port 560FLB Adapter (655639-B21). NOTE: For a two FlexibleLOM configuration, the HP 10Gb 2-port 560FLB FIO Adapter may be configured with the HP 10Gb 2-port 560FLB Adapter (655639-B21). NOTE: Please see the Smart Array Advanced Pack 2.0 QuickSpecs for Technical Specifications and additional information at http://h18000.www1.hp.com/products/quickspecs/13200_na/13200_na.html. NOTE: All 10Gb Ethernet adapters are Type A mezzanine cards that can be installed in any of the BL660c Gen8 mezzanine slots. NOTE: Please see QuickSpecs for technical specifications and additional information at: http://h18000.www1.hp.com/products/quickspecs/14221_na/14221_na.html. NOTE: Please see QuickSpecs for technical specifications and additional information at: http://h18000.www1.hp.com/products/quickspecs/14218_na/14218_na.html. NOTE: All 1Gb Ethernet adapters are Type A mezzanine cards that can be installed in any of the BL660c Gen8 mezzanine slots. NOTE: For a Factory Integrated Model configuration with one FlexibleLOM, it is added in the HP Networking section of "Step 2" in the Factory Integrated Models section earlier in this document; it is not added here. NOTE: For a Factory Integrated Model configuration with two FlexibleLOMs, the second FlexibleLOM is a different part number. You must select the first FlexibleLOM earlier in this document in the "Step 2" HP Networking section and select the second FlexibleLOM here in the "Step 4" HP Networking section. NOTE: The FlexibleLOMs here can also be used change the FlexibleLOM(s) that original came with the server. NOTE: Please see QuickSpecs for technical specifications and additional information at: http://h18000.www1.hp.com/products/quickspecs/14216_na/14216_na.html. NOTE: Please see QuickSpecs for technical specifications and additional information at: http://h18000.www1.hp.com/products/quickspecs/14219_na/14219_na.html. NOTE: Please see QuickSpecs for technical specifications and additional information at: http://h18000.www1.hp.com/products/quickspecs/14331_na/14331_na.html. NOTE: The server supports one or two FlexibleLOMs. Two are already included in the Pre-configured Models and the first one is added per Step 2 for Factory Integrated Models. The 1GbE FlexibleLOM option below is used to change the original 10Gb FlexibleLOM(s) that originally came with the server. NOTE: For a two FlexibleLOM configuration, the two FlexibleLOMs must be identical. NOTE: This is a Type A mezzanine card that can be installed in any of the BL660c Gen8 mezzanine slots. HP Hard Drives NOTE: The ProLiant BL660c Gen8 server includes the new HP hot-plug small form factor (SFF) SmartDrive carrier for enhanced management and reduced maintenance errors. HP drives from previous generation servers are not compatible with the BL660c Gen8 drive bays. NOTE: HP Insight Management Media Kit contains DVDs without licenses. Contains HP Systems Insight Manager, HP Insight Control, HP Matrix Operating Environment, and Virtual Connect Enterprise Manager software. Uses an integrated installer to perform quick and accurate software installation and updates. NOTE: Licenses ship without media. The HP Insight Management Media Kit can be ordered separately, or can be downloaded at http://www.hp.com/go/insightupdates. NOTE: Customer will receive a license entitlement certificate, which must be redeemed online or via fax in order to obtain the license activation key(s). Includes one or three years of 24 x 7 HP Software Technical Support Service. NOTE: The HP I/O Accelerator Options are Type B mezzanine cards that can be installed in BL660c Gen8 mezzanine slots 2 and 3. NOTE: For more information about TPM, including a white paper, go to http://www.hp.com/go/TPM. NOTE: The HP Smart Array P731m Controller is a Type B mezzanine card that can be installed in BL660c Gen8 mezzanine slots 2 and 3. NOTE: The BL660 has three installation locations for the "capacitor pack" that comes with the FBWC on Smart Array controllers. The first install location is for the embedded Smart Array P220i Controller. The second install location is for an optional Smart Array controller Type A or B mezzanine card with FBWC installed in mezzanine slot 3. The third install location is for an optional Smart Array controller mezzanine card with FBWC installed in either mezzanine slot 1 (Type A only) or slot 2 (Type A or B). NOTE: The HP Smart Array P721m Controller is a Type B mezzanine card that can be installed in BL660c Gen8 mezzanine slots 2 and 3. NOTE: The FDR InfiniBand adapter must be installed in mezzanine slot 1 for FDR mode and may be installed in any mezzanine slot if operated in any other mode. NOTE: The ProLiant BL660c Gen8 supports up to two expansion blades (Ultrium Tape Blade(s), HP D2200sb/D2220sb Storage Blade(s), and/or PCI Expansion Blade(s) ) that directly connect to the server via the enclosure midplane. NOTE: The PCI Expansion Blade provides PCI card slots for an adjacent c-Class Server Blade. NOTE: The ProLiant BL660c Gen8 supports up to two expansion blades (Ultrium Tape Blade(s), HP D2200sb/D2220sb Storage Blade(s), and/or PCI Expansion Blade(s) that directly connect to the server via the enclosure midplane. NOTE: The PCI Expansion Blade ships with one pre-installed PCI-X connect board. Also includes one PCIe connect board which requires installation. NOTE: HP qualified blank USB key for use with HP ProLiant servers that support the VMware virtualization environment. HP value-add software like SmartStart. HP recommends this industry standard USB flash device for use with VMware ESXi. USB device must be installed in the internal slot of the ProLiant server for use with VMware ESXi. Refer to HP VMware Getting Started Guide for installation instructions. NOTE: The USB flash media and Secure Digital cards are for integrated hypervisor virtualization environments needing a low cost boot solution with the highest performance and reliability. Learn more at http://h18004.www1.hp.com/products/servers/options/flash_drives.html. Each IntelÂ® XeonÂ® E5-4600 family processor socket contains four memory channels that support two DIMMs each for a total of eight (8) DIMM per installed processor or a grand total of thirty-two (32) DIMMs for the server. Up to 32GB capacity DIMMs are supported for 1.0TB of memory (32 DIMM slots x 32GB per DIMM). A minimum of one DIMM is required per processor. DIMM slots attached to each processor socket are only available if a processor is installed in that socket. DIMM sizes can be mixed in channel. To maximize performance, it is recommended to balance the total memory capacity between all installed processors and to load the channels similarly whenever possible. LRDIMMs and RDIMMs are distinct memory technologies and cannot be mixed within a server. HP memory from previous generation servers is not compatible with the BL660c Gen8 Server Blade. When HP 24GB (1x24GB) Three Rank x4 PC3L-10600R (DDR3-1333) Registered CAS-9 Low Voltage FIO Memory Kits are used, all 32 DIMM slots on the BL660c Gen8 must be fully populated with these 24GB DIMMs. For memory population rules and additional memory guidelines, please see the BL660c Gen8 user guide at http://www.hp.com/support. * LV= low voltage at 1.35V; Std = standard voltage at 1.5V. ** Using HP SmartMemory, 1333MHz DIMMs operate at 1.35V for 2 DIMMs per channel (2DPC). Third party 1333MHz DIMM memory may only support 1.5V at 2DPC. NOTE: Memory speed is a function of the processor QPI bus speed; see the table below "Memory Speed by Processor Model". NOTE: The ProLiant BL660c Gen8 server includes the new HP hot-plug small form factor (SFF) SmartDrive carrier for enhanced management and reduced maintenance errors. HP drives from previous generation servers are not compatible with the BL660c Gen8 drive bays. To review typical system power ratings use the HP Power Advisor which is available via the online tool located at www.hp.com/go/hppoweradvisor. NOTE: The FBWC is not required for RAID capability. The purpose of the cache is it can increase hard drive write performance and provides data protection in case the server losses power. NOTE: Each port is autosensing 1Gb/10Gb, and can interoperate with 1Gb or 10Gb HP BladeSystem c-Class interconnect components. Both ports will operate at the same speed.